Cooler Master has a very cool exhibit at Computex this year. The Inception Project #inceptionproject shows how the firm worked to meet the challenge of build the biggest water cooled PC ever, and you can see it in action in the feature video embedded directly below. The above 'PC' is said to be worth $100,000 and looks mightily impressive. Roughly estimating its size, it takes approx the same space as approx 20x mid-tower ATX chassis. I would say it is about 2.5m tall and 3.3m wide. Some sections are quite obviously based around PC chassis but others feature large banks of various water cooling components. Additionally there are lashings of RGB LEDs. 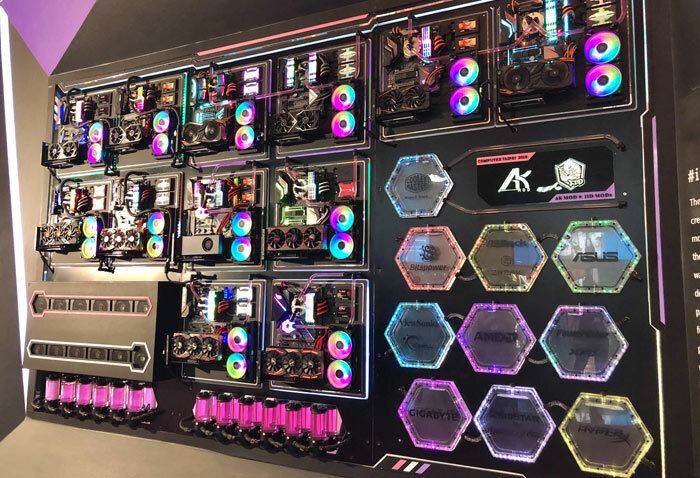 Cooler Master might be hosting the Inception Project at Computex but it is a collaborative project with additional sponsorship from the likes of AMD, ASRock, Bitspower, ASUS, G.Skill, Adata, PowerColor, Biostar, HyperX, and Viewsonic. Even more important is the skill and hard work (a month of efforts) put in by some of Taiwan's most talented custom PC modification teams; AK MOD, IID team, Brothers MOD, KMOD Studio and MJ MOD. Cooler Master has sent HEXUS several email bulletins regarding its Computex 2018 presence but is yet to finalise all its press releases and online material in support of the new products. However I can summarise here that those who are fond of Cooler Master products can look forward to new entrants to the company's chassis, thermal, and power ranges. On the topic of Cooler Master chassis the firm is showing off its recently announced MasterCase H500M, and the MasterBox MB500 TUF Gaming Edition. Coming soon to retail is the MasterCase H500. Perhaps more interesting are prototype designs for the MasterCase SL600M with chimney based heat regulation, the airflow prioritised MasterBox MB511 & MasterBox MB520, the MasterBox MB350P with aggressive styling, and the MasterBox K500P with fine 3D mesh design. 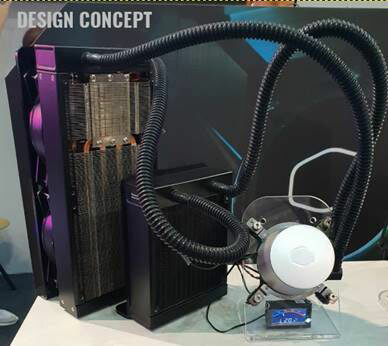 Cooler Master cooling designs on show are a new a concept version of the Hyper 212 with enlarged fins, more heatpipes, and RGB lighting sync. Furthermore, Cooler Master is showing off a new All-In-One transparent liquid cooler, its first thermal electric All-In-One liquid cooler, and water cooling systems with ARGB fans and pumps. Cooler Master says it is preparing the first new V Series PSUs in years, with platinum efficiency rating and in at least three different wattage levels. Meanwhile the MasterWatt V Series will be launched with bigger and semi-passive fans plus longer warranties. A completely in-house designed XG PSU is claimed to be a milestone product for the company, and the industry at large and is pictured below. For more details and photos of the new Cooler Master products you can keep an eye on its Twitter feed, and I hope the editor will record some videos too. Am I missing the point with Inception? It just appears to be 12 PC's mounted on the same mount with PSU/Water cooling components off to one corner… Therefore its not really a ‘PC’ - closer to a server rack! So this “PC” happens to have 12 individual systems, 12 power supplies, 12 reservoirs…. Hexus now in the realm of click-bait article names. Well, they could be clustered, which would be a considerably more interesting technically detail rather than “lashings of RGB” and it would give a reason for watercoolling rather than just doing it for the sake of it. Otherwise it just seems to be a marketing gimmick designed to fool technically illiterate journalists - so I'm surprised to see HEXUS falling for it - unless there really is more to it than a photo opportunity. But otherwise it seems like a broken pencil - pointless. Case manufacturer has “heat rises” epiphany.